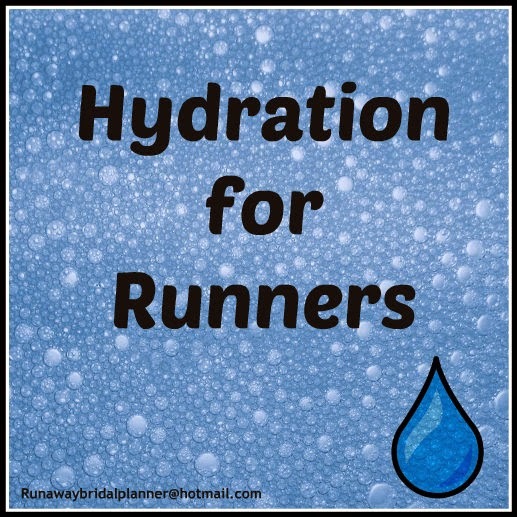 Today I want to share with you my take on hydration. Keep in mind I am not a Dr. or personal trainer, just a runner. Anything you take from this should just be remembered as my opinion and not advice! Hydration can be one of the biggest mistakes runners make, but also the easiest to avoid. Most people are probably already hydration smart. But if by chance this gives someone some help or something to think about, then I am happy to share my opinion on this subject with you! One big mistake I see with newer runners, and even some seasoned runners. They think, if they have a race coming up, or even a big training run that the day before they need to pound down the water the last 24 hours leading into it. All this is really going to do is make you pee a lot! Actually it takes several days to build up a healthy hydration level. You can't treat hydration like a night before college cram for a test. It doesn't work that way! At minimum you should begin making sure you are fully hydrated 5 days in advance from a race or long run. If possible try to always make sure you are drinking plenty of water and fully hydrated. But if your not good at it all the time, don't wait until the day before. Make sure 5-7 days before the race you are already fully hydrated. Doing so will reduce your hydration risks come race day, and possibly even give you a better race day! When is the best time to train your body how to hydrate properly? While your out on your daily runs, training for your races! The key to TRAINING isn't just to condition the body or to build up your mileage and speed. It's also the time to experiment, try new things, find what works best for you and hydration is of them. This way, come race day, you will know exactly what to do and not be one of those race day experiments! If your planning for a specific race, look on their website, see what mile markers they will be handing out water at. Train with this. Most races offer water every 2 miles. Some every 3 miles until towards the end they pick add a few more. If you plan on drinking the sports drinks on the course during a race. Check ahead of time what brand will be offered and train with those. It might not matter much in smaller races, but if your going to be doing a marathon or ultra, you'll be thankful you did. No sense in spending more time in a port-o-pottie than you have to! Another mistake I see a lot of runners do is drink way too much while they are waiting to start the race. I once saw a guy on a bus to a starting line with a 6 pack of Gatorade. At first I thought he was bringing them for a group, until on the 30 minute bus ride I watched him drink 2 1/2 of them. I am pretty sure I can guess where he spent a lot more time than necessary the first half of the race. Question to ask yourself. Are you drinking more water than you drink before you headed out for your last few long runs? If so, your probably drinking too much. 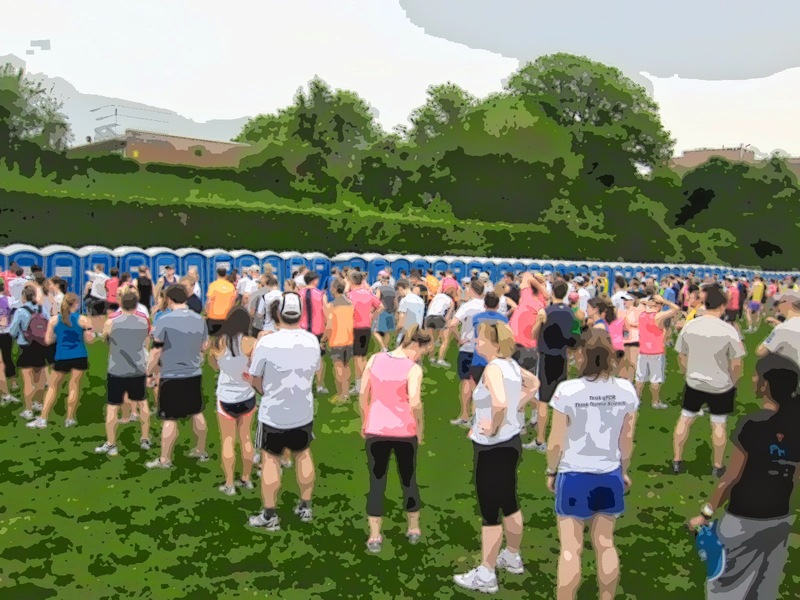 Pre-race jitters and nerves will already send you to the bathroom a few times before the race starts. So the question is, do you really want to be one of those runners waiting in those massive long lines at the first few miles during the race (if you've raced before, you know exactly what I am talking about). If not, then train yourself to drink correctly in training runs, so your not over drinking come race day! I see this one so often, I literally cringe each time I see a runner do this. A lot of larger races, probably to reduce their liability so they can make sure runners have plenty of water as needed on a course, will have water stops at every mile on a course. Apparently some runners think because they see them and they have free water/drink offered that they have to stop and take another drink??? Do you need water every mile in a race? OF COURSE NOT! In fact, the risks of drinking too much water are more dangerous than those of not getting quite enough. If you don't believe me, just Google it! A better use for all those extra water stops in a race, especially if it's a hot one. Only drink every 2-3 miles as you have trained your body for or as needed. If it is a hot day, don't stop and drink at each stop. If you feel you cannot say no to a friendly volunteer for that race cup they are pushing toward you, just grab it and pour it over your head, or down your shirt instead! If you do enjoy drinking sports drinks during a race. I'd like to offer a few things to keep in mind. A few races actually pour them straight from a manufactures bottle, which is the best! However, a lot of them mix powders. Who is mixing the powder? Generally inexperienced volunteers. Why can this be bad? They get in a hurry, don't use correct measuring cups, or don't really know what they are doing, the list could go on. If you've ever taken a drink like this, you generally know immediately that its probably not going to sit well on your stomach. * When I run a marathon if I decide I want a little flavor of them, I wait until I am at mile 18 on a course, that way if it messes with my stomach wrong, I will be at the finish before anything happens. * Unless I know the drink came from a manufactures bottle, I always chase a sports drink with a water. That way if it was mixed incorrectly, chasing it down with an extra water after just reduces your chances of getting too much powder mix in your tummy. * If it tastes bad right when you take the first sip, STOP! Toss it and grab something else! One of the biggest mistakes I see new runners make, and especially those who are looking to drop a few pounds, is they'll go out for a 1-6 mile run and follow it up with a sports drink as they cool down. Or they'll carry their sports drink and sip on it as they run. Big mistake, especially if you are a runner who is trying to lose weight, I highly recommend you DO NOT drink sports drinks. Truth be told unless your training for a marathon you really don't need them. There have even been many runners articles written about this very subject. The amount of calories in sports drinks, for casual or low mileage runners is too much, one drink and you can even drink far more calories than you just burned. If weight is not an issue and you enjoy your sports drink, go for it. 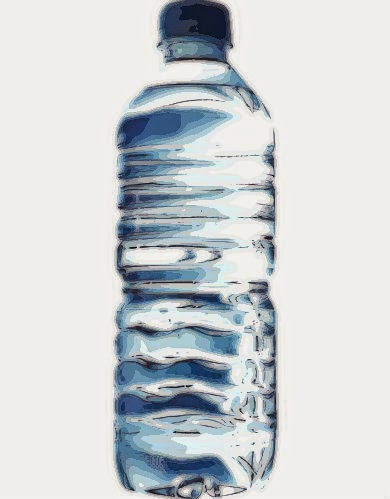 But if you are looking to drop some pounds as you run, I highly suggest you consider water as your source of hydration! Let those miles you run actually burn calories, and drop the pounds. If this is a subject your not familiar on. Back in January I wrote an article about sports drinks vs. soda. that might interest and surprise you, you can check it out HERE.